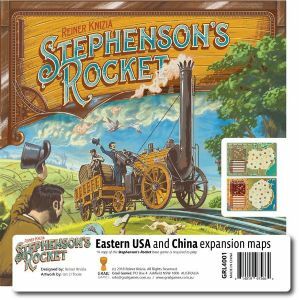 This expansion consists of a large, double-sided board, offering two alternative maps for players to enjoy playing Stephenson's Rocket upon. One map depicts the eastern USA, and the other, eastern China. While all game rules remain the same, the different maps add variety to how the game feels and plays. The board is designed to expand and compliment the Stephenson's Rocket's second English edition, however, it is possible to use these expansion maps with the original version of the game. Reiner Knizia expands his fleet of tile laying games with this game about colliding railroads in early 1800's England.